Tarot and cards of divination are potent healing tools that enable + encourage a gaze within oneself, into subconscious realms for honest reflection + contemplation – sparking the potential to create significant transformation from deep rooted levels. When root issues are uncovered and acknowledged, blockages from old thought patterns/behaviours can begin to dissolve! Personally, casting cards has been a life changing, eye-opening experience, and my friends/family share the same sentiment. Each reading is blended with intuitive guidance in addition to traditional card knowledge for the ultimate uplifting experience. I lovingly to refer to my sessions as “coffee dates” – the way you might get together with good friends to discuss matters close to the heart – which is very much what this experience feels like. Now I extend the opportunity for truth + empowerment with you in a safe and friendly space. Currently, I offer live sessions either in-person or via Instagram Live Chat or FaceTime. Email readings are available as well (details described below), and giftcards to celebrate special people in a surprising but extraordinary way! Please contact me with any further inquiries or curiosities, I’d be happy to chat! Email arcanum.iter@gmail.com or visit the Contact Page. Instagram Video Chat / FaceTime reading // 30 min. Just like an in-person session, but we are virtually face-to-face from the comfort and convenience of wherever you may be! Typically within this timeframe, 1-2 questions may be answered. This can be a free-form, general conversation without set spreads (unless specific questions are provided ahead of time). Grab your coffee, get cozy + prepare to discuss in detail, topics where clarity and direction are being sought. Once payment is received, scheduling (in EST) will be discussed via Instagram Direct Messaging or email. Instagram Video Chat / FaceTime reading // 60 min. Just like an in-person session, but we are virtually face-to-face from the comfort and convenience of wherever you may be! This can be a free-form, general conversation without set spreads (unless specific questions are provided ahead of time). Typically within this timeframe, 3-5 questions may be answered. Grab your coffee, get cozy + prepare to discuss in detail, topics where clarity and direction are being sought. Once payment is received, scheduling (in EST) will be discussed via Instagram Direct Messaging or email. s o u l p u r p o s e + p a t h // 60 mins. This spread was created for those seeking clarity and definition on their path of self-development. Insights will illustrate a clearer picture into the main purpose of incarnation as well as what the life journey may entail along the way. Which embodied characteristics are needed to authentically fulfill your purpose and step into your full potential? Instagram Video Chat or FaceTime session. c h a k r a r e a d i n g // 75 min. This spread offers a view into the 7 major energy centres of the body called "chakras" - a Sanskrit term alluding to "energetic wheels of light". The quality of each energy wheel within us make up the experience of our physical security, creativity, self-confidence, ability to love, communicate, use intuition and ability to connect to source or spiritual consciousness. We will uncover how each centre currently operates, where energetic flow may be impeded or overextended -- thus informing the areas requiring work to achieve optimal, overall balance. c o n n e c t i n g with a n c e s t o r s // 75 mins. As we progress into the dark phase of the year, the “veil between worlds” thins and we become perfectly attuned for deeper inner exploration, as well as, connecting with our relatives/ancestry in unseen realms, on the otherside. This session is suited for those looking to gain insight into the energy, purpose and lessons involved with their ancestral lineage and how it may affect current personal/familial life experience. No historic ancestral knowledge required as any member of ancestry may step through, including unknowns. Instagram Video Chat or FaceTime session. m i n d b o d y s o u l // 25 mins. A brief snapshot or check-in of your current holistic experience: mentally, physically and emotionally/spiritually. Instagram Video Chat or FaceTime session. s h a d o w w o r k s p r e a d // 90 min. c e l t i c c r o s s // 75 min. 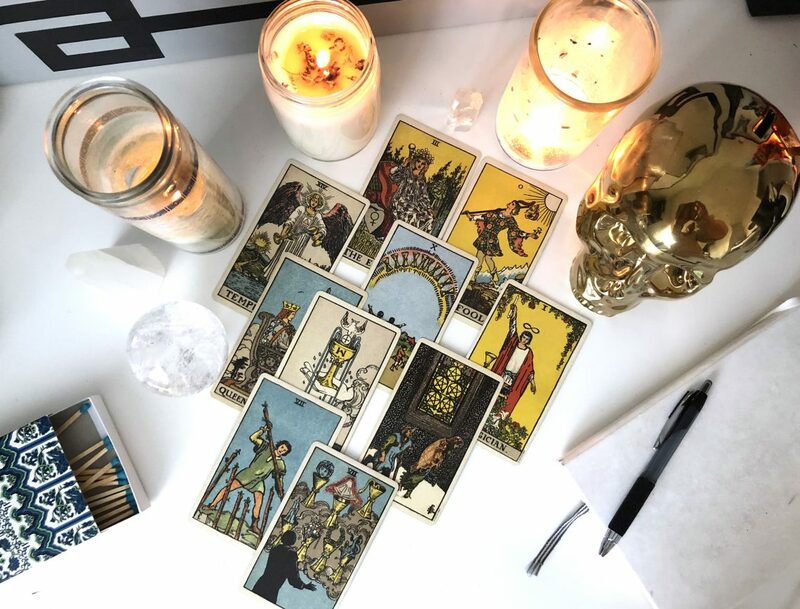 A traditional 10 card Tarot spread providing an in-depth overview of the inquiry with details on your current state, aspirations, future potential + outcomes. Oracle cards may be added for additional clarity + support! Instagram Video Chat or FaceTime session. Use Tarot + Numerology to determine the landscape of the year ahead as well as overall themes in your life in 2018! Find out which numerological vibration + corresponding cards will be influential to you. Month + date of birth are needed for this reading (year not required). Read about my own personal pulls on my Instagram page! I will intuitively choose the most appropriate decks I feel resonate best with the inquiry, to provide meaningful guidance. Various decks include: Miracles Now, Messages From Your Angels, Plant Energy cards, Archetype cards, Goddess Guidance, The Wild Unknown Animal Spirit, Connected and Free oracle, Magic & Manifestation cards + many more! Need a magickal boost? Looking for a dynamic spread enriched with colourful inspiration + multi-faceted guidance? It’s easy to feel elevated with this one! Choose from various decks mentioned above + many more! Did you know all 12 zodiac signs have a corresponding Major Arcana card? Blending Tarot + Astrology we will uncover cards that correlate to 3 significant birth chart points: your Sun sign (sense of “self”) + Moon sign (subtle, emotional, subconscious “self”) + Rising sign (initial outward personality). Shadow aspects of each covered as well. An intriguing + relevant spread for this entire lifetime! Birth chart information required for this reading: D/M/Y, time and location of birth. g i f t c a r d ! Looking for a unique or unusual gift idea? Why not celebrate that special friend or occasion with a $50 giftcard towards a completely customized Tarot and Oracle reading! Please provide recipient’s email address to be contacted for consultation of their custom spread. If possible, please include background information of the inquiry in the Notes section. If a general reading is preferred, please specify. Create Custom Spreads! Looking for something a little different than the features above? I would be happy to design a custom spread for you. Please get in touch to discuss requirements/goals of the spread. In-Person Events – Birthdays, bridal showers, private parties – please contact me to discuss adding a mystical + magickal service to your special event in Toronto/GTA. Please note: Tarot readings are for entertainment/self-development purposes and should not replace professional advice. Additionally, your confidentiality is critical and readings are never shared unless permission is granted. Other questions? Feel free to contact me at arcanum.iter@gmail.com to discuss further.